The Nissan Sports Sedan Concept could be a hint towards the future Maxima. To help celebrate its 80th anniversary, Nissan has decided to give a gift. (“Well, aren’t they just the sweetest things,” your mother would probably say.) At the 2014 North American International Auto Show on Monday, the Nissan Sport Sedan Concept made is long-awaited debut. In what is being hailed as a design study geared toward next-generation style, the concept is Nissan’s effort to create a four-door sedan that actually feels like a sports car. 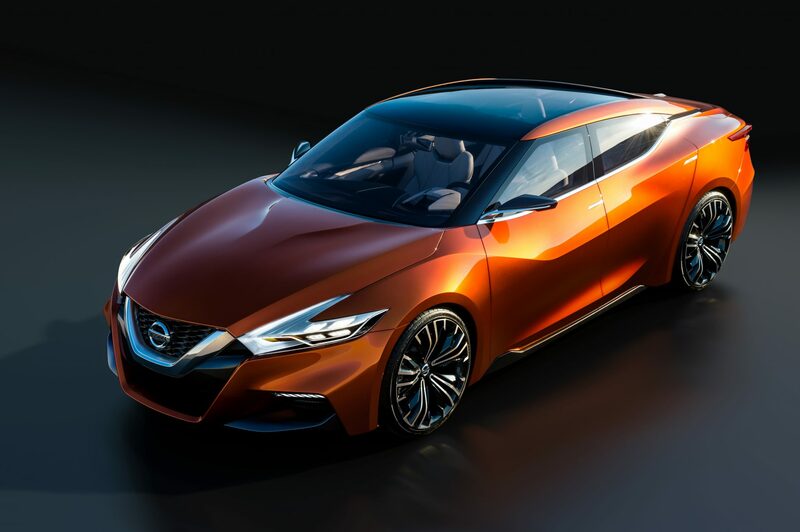 The design language of the Nissan Sport Sedan joins the Nissan Resonance and Friend-ME concepts as the next evolution in the automaker’s design language; each vehicle features the V-Motion front fascia, floating roof, and boomerang headlights and taillights. The Sport Sedan has a low and wide stance with forward-sloping hoodline and lower ground clearance, a wide windshield, and a deep-scooped front fascia to give it a sports car profile. When it’s in motion, the Nissan Sport Sedan Concept draws its power from a 3.5-liter V6 mated to a sport-tuned Xtronic CVT® to dole out more than 300 hosepower. This means that the Sport Sedan will be a particularly-beautiful orange blur as it roars past. Did we mention what is perhaps the most striking aspect of the Nissan Sport Sedan Concept? That would be the “Strad Amber” paint, which draws inspiration from the color of violins and is comprised of an orange-amber topcoat over a gold base. While the Sport Sedan is merely a concept, the prospect of aspects of its design language being incorporated into future Nissan vehicles has us excited.